There is too much awesomeness in this cookie!! Uh I would be helpless near these cookies too, and will eat all of them in one day, not week!! Just the thought of salty chips combined with sprinkles makes me hungry now!!! without a doubt, i’d happily eat all 18 cookies too. sweet + salty is the way to my heart. sprinkles are my crack and your giant rainbow cookie base has changed my life. love these. and love the way your mind works jessica. !!! the downside of food blogging: eating everything you make and then feeling reaaaaaaally sorry you did! Ohhh my gosh. These look like the best cookies EVER. I have a weakness for the sweet and salty combo, and those salt and vinegar chips added to a cookie sound amazing! Wow these are the most compost-y cookies I’ve ever seen! So many ingredients but they all sound so fantastical. Who knew I would crave something called “compost” so badly? These cookies are SO not real life. Because if they were, my life would be made of MAGIC!!! Those looks so good. I would have never thought to put chips in a cookie, but from your description it must be good. OMG these look AMAZING!!! With all those sprinkles they’d make a fun little birthday gift too! Oh my god Jessica, I need these in my life. Plus I’m glad I’m not the only one who can and has eaten an entire batch of cookies. These look surprisingly delicious. I would have never thought to put chips and pretzels in cookies! Also, your writing style continues to get me every. single. time. I am always laughing my way through your posts! I’d give my right arm for one of these right now. I made the Milk Bar compost cookies in the spring (with salt & vinegar chips) and pretty much ate each one all by myself. Now I wan another batch. I am overwhelmed by the awesomeness of these cookies. 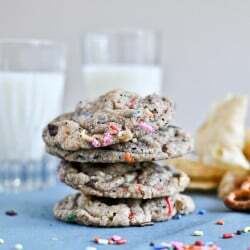 I have made the Confetti Cookies before and they are by far the best cookies I’ve ever had, but these take them to a whole new level. How cool that you thought to mix them up like this?! I totally feel you on the salt and vinegar chips. I’m like crazy in love with them. I’m the only person in the house who will eat them, but that’s okay considering it’s a good excuse to eat the whole bag or else they will go bad–that’s what I tell myself at least. I’ve never wanted to eat compost in my life… until cookies! Your compost looks so colorful (my pantry is just full of nuts and grains). Yea, I could eat my way throw that batch of cookies too! Although any suggestions for a different flavour of chips for those of us who aren’t salt and vinegar fans? I used Cape Cod waffle cut sea salt chips because I’m not into vinegar chips either. I liked them for a substitute because they’re still good and salty and have that awesome crispy texture. I love this recipe! I always end up with a few sprinkles, a couple of chips, and leftover pretzels with no dip in my pantry so these will be great! Coffee grounds in a cookie – I’m WAY into it! Gosh Jessica, your’re wild this week with those cookies ! Saw a similar mix like yours on Pioneer Woman. She mixed it into vanilla ice cream ( or TD 0% Greek Yogurt ) and then put some of the mix on the bottom of a dixie cup. On goes the ice cream, in goes the popsicle stick. All back in the freezer. I don’t know if I’d be able to leave them in there long enough to freeze. I think your blog is great. I enjoy your writing and sense of humor. You are one of my very favorite blogs. You are so honest. Keep cooking ! These cookies look and sound amazing. I will definitely be trying them sometime soon!! Holy crap…salt and vinegar chips in a cookie?!? I feel like you have lost your mind, but in a totally cute headless way. Must try this now. NOW. I was gifted the momofuku milk bar cookbook and was crazy overwhelmed. Have you made a lot of recipes from it? Slash, where’s an apprehensive baker to start? There are no words for how good these are or how amazing they make your kitchen smell. I considered it a HUGE victory I only ate three last night during baking. My co-workers who they’re for have no idea what cookie insanity is headed their way. What kind of chocolate chunks did you use for this? Did a unicorn magically poop these out, they look delicious! it has that lovely rainbow delight to it. 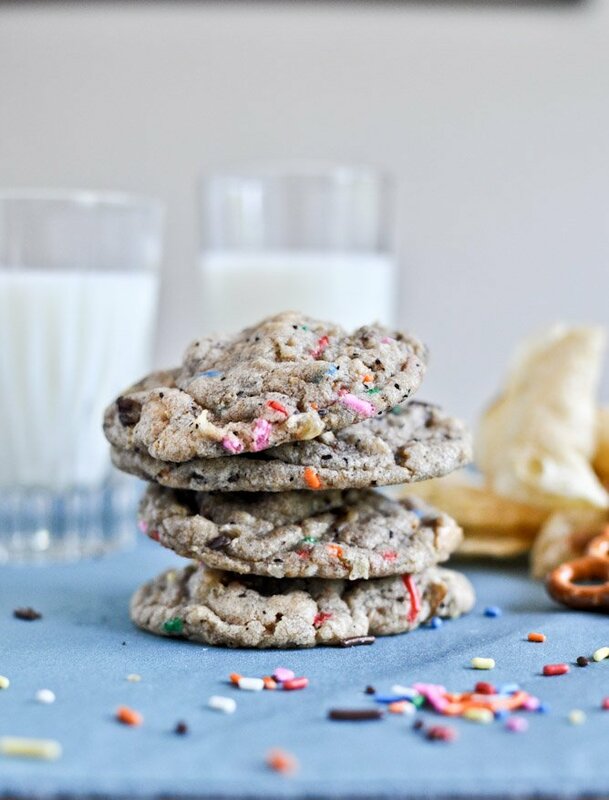 Salt and vinegar chips – in a cookie? I thought I was adventurous in the kitchen, but you just won. I am not that brave! I made these this weekend for a bachelorette party at the beach! I am nowhere near as fun and bold as you are, so I used regular potato chips, pretzels, mini chocolate chips, and tons of peanut butter chips and marshmallows. They were… beyond. You rule, man. I made these today and they turned out wonderful! Although some of them came out wonky looking and not at all circular, they taste absolutely delicious and I cannot wait to share them with my friends. Such a wonderful recipe, thank you for sharing! these look amazing! i think i would wrap these up in a pretty box all for myself and then hide it. I made these last night with a couple tweaks around the compost items with things I had on hand like regular potato chips and cupcake Goldfish. They are so delicious. I took 1 1/2 dozen to work and they were gone by lunch. Took the rest to my nephews. I had to get them out of the house before I ate them all. Thanks so much for the wonderful recipe! I made these cookies sans the sprinkles, replaced the pb chips with butterscotch, and used browned butter. These are officially one of my favorite cookies of all time!! I know someone who ate them 3 or 4 days after I made them, and had been on a two day road trip and back!! Thank you so much for the recipe! Pingback: 5 Favorites for Friday!